The Great Lakes region is home to many species of bats. 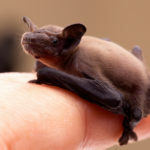 Among the most common is the little brown bat (Myotis lucifigus), with a range covering most of the continent and extending as far north as any bat in North America. 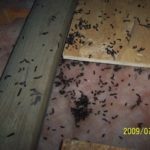 While predation is not a problem for little brown bats, hundreds are killed each year by exterminators for taking roost in homes or other human dwellings. 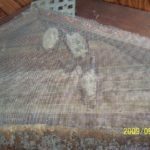 This is unnecessary, as sealing the point of entry after bats have left for the night is much cheaper, safe, and effective. 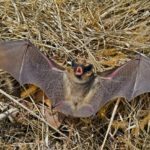 Little brown bat habitat and behavior vary seasonally. Males and females typically spend the summers apart from one another. They come together again in early fall when courtship and mating are initiated. After mating, they’ll over-winter in moderately sheltered hibernacula, including caves, mine tunnels, and occasionally in your home. Upon leaving their hibernacula in spring, females will form small groups and move to summer roosts where they bear and nurse their young. These nursing sites are typically used year after year. Young are typically born from early June through early July, and are usually capable of flight within 21 days. 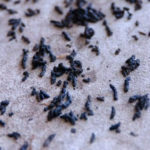 Little is known about the summer whereabouts of males, though they appear in common places such as caves, forests, and often attics. 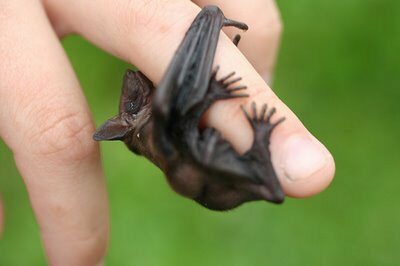 Little brown bat weighs between 5 and 14 g. The length varies between 60 and 102 mm, and the wingspan between 222 and 269 mm. The forearm, including claw, measures 33 to 41 mm, and tail length measures 28 to 65 mm. The hind foot is between 8 and 10 mm in length, ears are 11 to 15.5 mm, and the tragus is 7 to 9 mm. 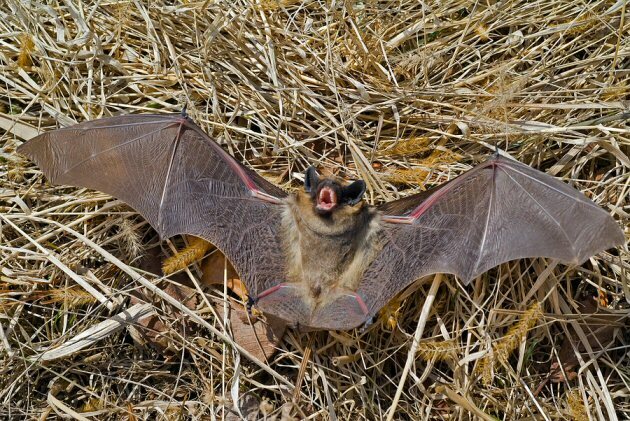 Little brown bats fly at speeds as high as 35 km/hour and average 20 km/hour. Females are larger than males, especially during the winter. 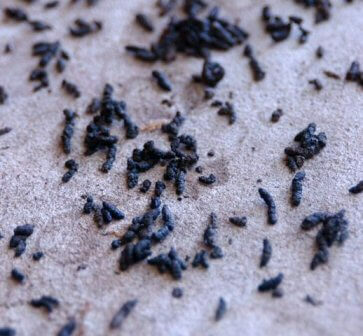 Little brown bats are primarily nocturnal and emerge from their roosts at dusk. Primary activity occurs about two or three hours after dusk and secondary activity may occur before dawn; most individuals return to the roost by four or five o’clock in the morning. These bats usually enter daily torpor. During the winter, hibernation time depends on altitude and location of the roosts. It usually starts between September and November and ends in March to May. The young remain active longer in the fall to build fat deposits to last the winter. Myotis lucifugus does not migrate long distances for hibernation roosts. Individuals travel only up to 100 miles. This species does not show territoriality at roosts, and large colonies of as many as 300,000 bats have been reported in a single roost. 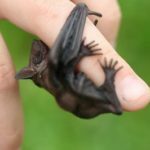 Big brown bats are one of the most widely distributed of America’s bats, ranging from Canada to northern South America and the Caribbean Islands. 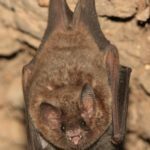 Big Brown Bats will typically use the same home regardless of the season, but typically colonies will be found in hollow trees, attics, behind shutters, old chimneys or stacks, and caves. 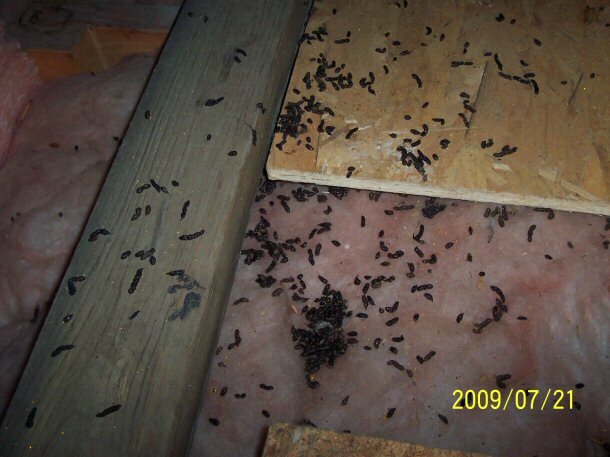 Big brown bats are not tolerable to high heat and will often move to a different location or further down in the structure closer to the basement or ground level. 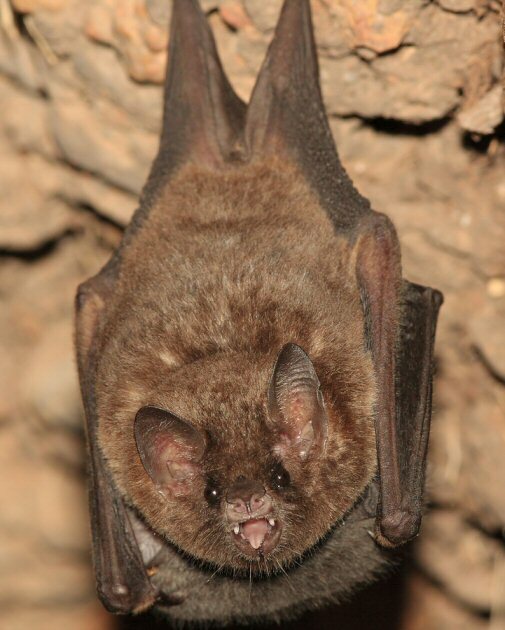 The generic name Eptesicus is derived from the Greek, meaning “house flyer”. 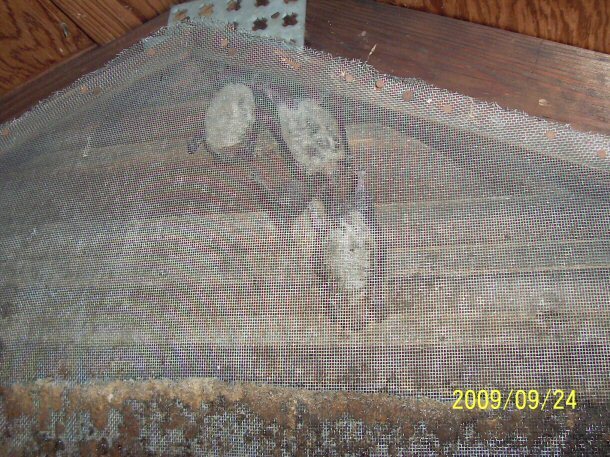 All this bat needs is a small hole or warped, loose siding to gain entry into a home. Once inside, it prefers to roost in double walls or boxed-in eaves rather than attics. 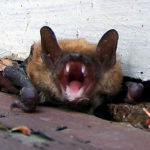 It is reasonable to speculate that populations of the big brown bat have increased with an increasing number of human habitations. Big brown bats are most often found in trees, attics, and bat houses in the summer. Besides human dwellings, it has been found to take up residence in barns, silos, and churches. Total length is 110-130 mm of which the tail is about 38-50 mm. Forearm length is 41-50 mm; hindfoot length is 10-14 mm. Height of the ears from the notch is 16-20 mm. The wingspan is about 330 mm (13 inches). This species is sexually dimorphic in size, females being slightly larger than males. The skull is comparatively large and contains 32 teeth. The teeth are sharp, heavy, and were described as capable of causing severe bites. The bat’s nose is broad and the lips are fleshy; the eyes are large and bright. The ears are rounded and the tragus is broad with a rounded tip. 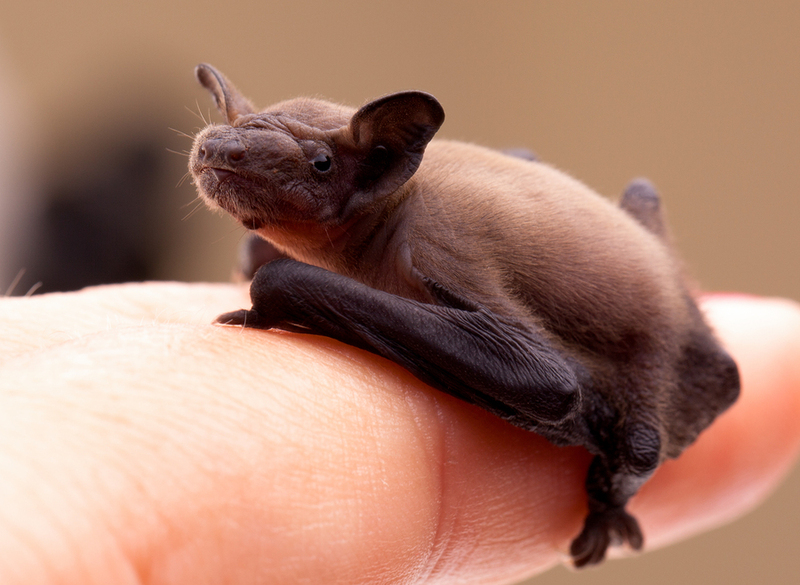 Big brown bats are primarily nocturnal and emerge from their roosts at dusk. Primary activity occurs about two or three hours after dusk and secondary activity may occur before dawn; most individuals return to the roost by four or five o’clock in the morning. These bats usually enter daily torpor. During the winter, hibernation time depends on altitude and location of the roosts. It usually starts between September and November and ends in March to May. The young remain active longer in the fall to build fat deposits to last the winter.